It stands for Overall Nutritional Quality Index and it'll do for you what the Health Check doesn't - steer you to more nutritious choices and do so with rigorous scientific underpinnings. Developed by 12 of the world's leading nutritional experts in a manner explicitly designed to shield them from the influence of industry, ONQI is the dead-simple product of the complex algorithm developed by these experts which rates a food on a scale of 1 to 100 - the higher the number, the healthier the food. The expert panel included Dr. David Katz co-founder and director of the CDC funded, Yale University - Griffin Hospital Prevention Research Center, Dr. Walter Willett chairman of nutrition at Harvard sine 1991 and regularly featured researcher on this blog, Dr. Rebecca Reeves past president of the American Dietetic Association, Dr. David Jenkins from my alma mater the University of Toronto and the inventor of the glycemic index and 8 others who I haven't been able to identify from the various news articles yet. "Given the rising toll of nutrition-related health conditions in the U.S., in particular obesity, it is important to provide consumers with a simple standard regarding food choices that is as reliable as it is easy to understand. The ONQI is a labeling system that can help everyone make healthier choices in every food category quickly and easily"
"People can improve their diets, and their health, both by changing the categories of foods they eat most - for example, by eating more fruits and vegetables - and by making better choices within a given category, including snack items and desserts. The ONQI is designed to do both. 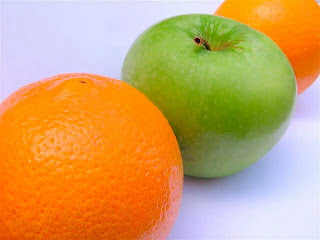 You can, in fact, compare apples to oranges (oranges win), or apples to marshmallows. But of more practical value you can compare one box of kid's breakfast cereal to another, cut right past all the marketing hype, and get to the truth at a glance." If you want to see Dr. Katz talk about it, click here.